A way to express their feelings Teenagers, especially of the female variety, seem to get caught up in a lot of strife and are often filled with angst. A journal is a great way to give them a way to express their feelings and self doubts but sometimes they can concentrate only on the bad and forget to note all the wonderful and funny things. The Rant and Rave book* is a light hearted journal with a twist, it is two sided and gives kids the opportunity to think about the good as well as the bad things about school. A USB stick A lot of homework is now done on the computer, at least once a week someone in the house needs to make a power point presentation, and they then need to be able to take this work back and forth between home and school. A USB stick is a must and these little minions USB sticks* are so darn cute they are sure to crack a smile when they use it, even if they have hours of homework ahead of them! Clothes Labels You would think by the time they were doing their GCSEs that teenagers would be able to not lose anything and everything they take to school. I’m sorry to burst your bubble but I’m afraid they are just as bad, if not worse, than the little kids! This nifty little label maker from Brother holds cartridges that are filled with different tape depending on what you want to label, from clothing labels, to books, to well pretty much anything! It at least gives them a fighting chance of bringing home the right jumper! A drinks bottle Keeping hydrated is really important if they want to stay alert during lessons and vital if they are taking GCSE PE as my two are. This Brita Fill&Go bottle* is not only large enough for their needs, but also has a filter to make sure that whenever they fill it up the water is pure, clean and tasting fresh. Putting it in the fridge overnight will keep it nice and cool too! Lever Arch folders The girls were told by a friend, who has just finished her GCSEs, that they should invest in lever arch folders for each subject, especially the core subjects like English, Welsh etc. I guess there will be many essays and handouts over the next two years that will all need to be kept safe in one place. These ones from The Works are only £1.50 so I will definitely be stocking up! Revision guides I remember how hard it was to know how to break down the masses of information that we were being taught into manageable chunks. A good revision guide does so much of that work it can really help teens learn just the important bits. Amazon has a really good range and I will also be looking at getting some Welsh language ones from the WJEC website as trying to translate between two languages at the same time as trying to revise really doesn’t help, believe me I’ve been there! Index cards Again to help them retain information I think writing things down really helps, well it does for me anyway. These ringbound index cards are really handy to jot down the really important bits of information and the fact they are joined up means they won’t be losing them everywhere! I think I will be getting them one per subject to keep everything all organised nicely. 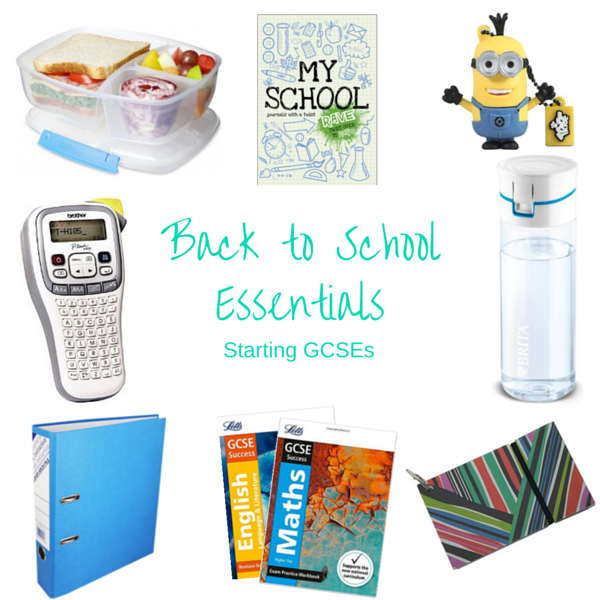 So these are my essentials for starting GCSEs what would you add to this list? Great post. It’s a big step forward for children and an exciting time. I would add pens to the list of essentials, and lots of them! Heather recently posted…Into the woods…. Good luck to your twins with their GCSE’s. My daughter is eagerly waiting for her results to come through, two more weeks! My son will be choosing his options this year. Should be fun as he really has no idea what he wants to take!! I actually miss the back to school days purely for the new stationery (my addiction hasn’t lessened over the years lol). Agent M is going into Primary 4 so all his back to school is minion themed … Will be a while before he’s in secondary sitting exams lol. I can’t wait till Holly needs to get stuff for school. I love stationary!! she 2 though lol. I have a bit to wait!! Brilliant list. I’m a teacher and I wish all my students were as prepared as your two! Best of luck with the start of their GCSEs.